Every time we go online to shop, do our banking, post a comment on social media or simply do a little internet surfing we open ourselves up to being watched, tracked, added to arbitrary lists, and in general analyzed by people, companies, and governments we have never met. One\'s ability to go online safely without being under surveillance is in question. 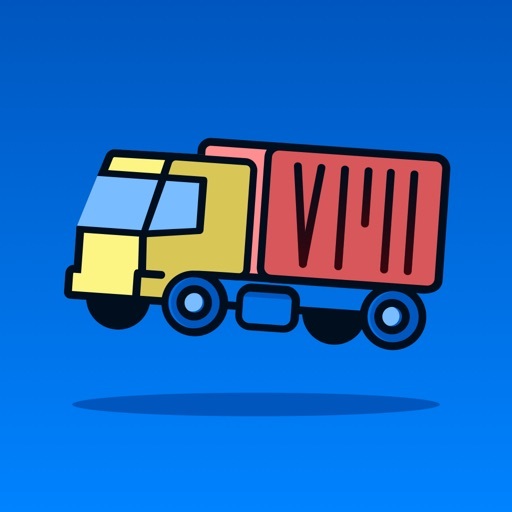 Enter the Cargo VPN app from Eltima. This app not only keeps your privacy safe online but has some cool features that can even save you money. 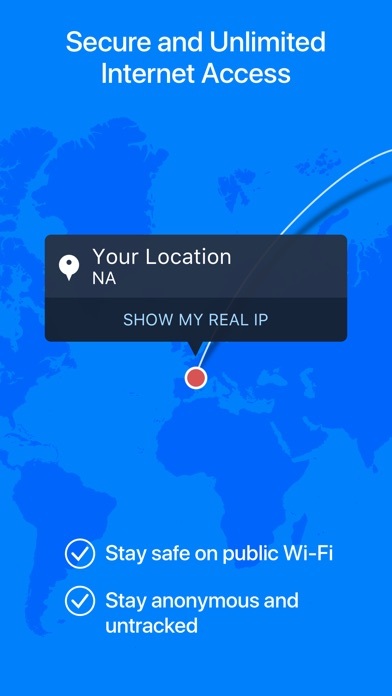 Essentially the Cargo VPN app is a DSN firewall which prevents others from monitoring you online. With it, you are safe from things like some stranger detecting you logging in, tracking your location, or installing malware. Plus other everyday tasks like your private communications being read or heard by others is also now safe from prying eyes. You can now use any WiFi connection without feeling like you are opening yourself and your device up to trouble. One feature I love is the apps ability to disguise your geolocation. Why is this good? Because companies like hotels, rental cars, and airlines charge you more if they detect you are in San Francisco than if you are in... say... Mexico City. The app has access to over 70 locations worldwide with 1000s of high-speed servers at your disposal. This feature can save you money if you travel allot. 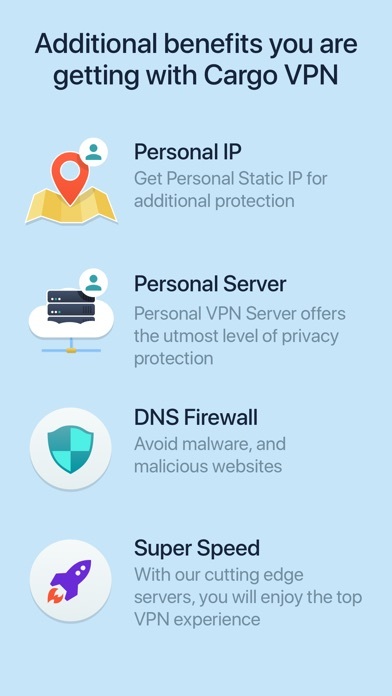 Cargo VPN is a solid app that offers the safety and security necessary to continue using the internet as we have all become accustomed to over the years, without sacrificing our identity or privacy. EasyAppFinder give it 5 Stars! Yapert: Where Fans Stay Up to Date! Celebrity Guess (guessing the celebrities quiz games). Cool new puzzle trivia word game with awesome images of the most popular TV icons and movie stars. Have fun predicting the famous celeb, talented musician, iconic athlete and sports icon. Free! Cool Off: Be Green. Save Money. With Cargo VPN iPhone and iPad users also get a built-in DNS Firewall for the best protection from tracking, logging, etc. *Your IP address, location and online identity are hidden for the top privacy. *Your data is kept safe when you connect to public WiFi. *While you are using the VPN app for iPad/iPhone your online activity, location, communications are kept safe from unwanted surveillance. *Your login details, account numbers, billing address are safer this way especially if you are using someone else's WiFi. *Did you know that flights, hotels, rental cars and more are priced differently for different geolocations? 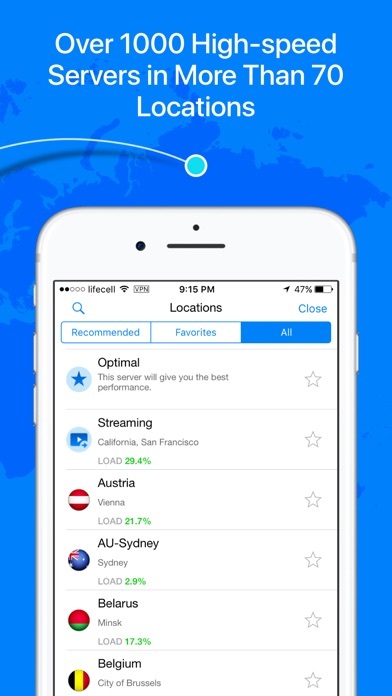 You can save money by simply adjusting iPhone VPN settings in our app. *There are more than 70 server locations with over 1000 high-speed servers all over the world. *One subscription includes up to 5 devices in one account. * Exclusive Static IP address. * Personal Server for utmost speed and safety. * Additional slots for new devices. 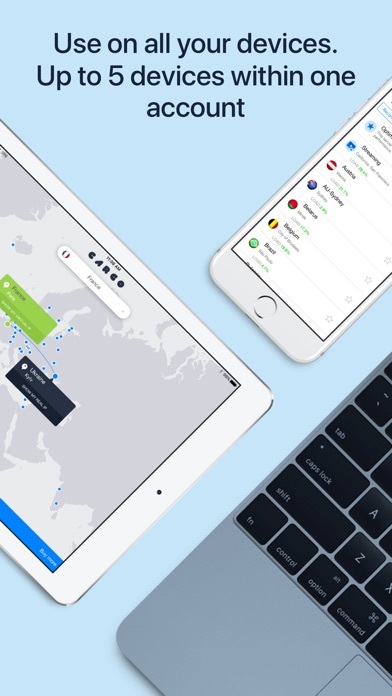 Cargo VPN is probably the best VPN for iPhone and iPad with all the features it offers and a free 24-hour trial period. ** Subscriptions will be automatically renewed unless canceled. - Manage subscriptions and automatic renewal in your Account Settings after purchase. - One cannot cancel the current subscription during its active period. - Auto-renewal should be turned off at least 24 hours prior to the end of current period. Otherwise you will be charged for the next period. - Your account is going to be charged for the amount of your current subscription within a 24-hour time frame before the beginning of the new automatically renewed period. All costs are as mentioned above. If you have any questions, feel free to contact us at cargovpn_support@eltima.com. We are here to help. Your feedback is welcome and will be taken into account when working on new versions.